Here is a run-down of the different base year plans for Daisies, Brownies, and Juniors! Remember, once you select one of these year plans, you can always customize it with activities from the other plans (or activities of your own)! 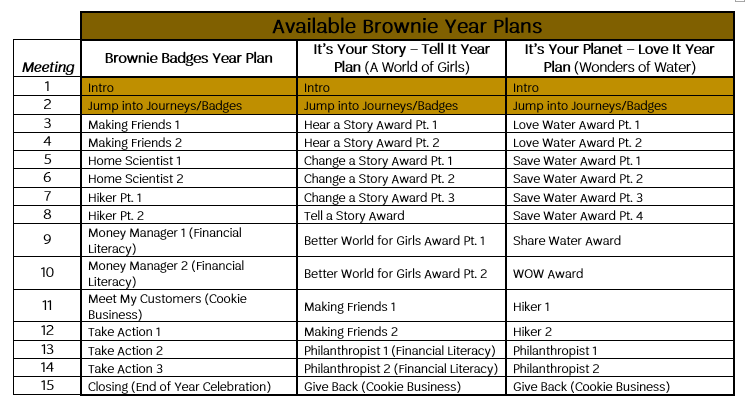 For Daisy, Brownie, and Junior levels, Create Your Own Year Plan option will allow you to mix & match the Girl Scout Leadership Experience to fit your troop’s interests. This means that you are now able to access all meeting content for all 3 levels! For our older girls, there is no pre-created content, but you can add custom activities or council activities to your year plan. Most options for editing your year plan are found at the top of the Year Plan page as seen here. Specify Dates and Locations: After you select your Year Plan option, you will view the preset options without any dates. To set up meetings to follow your troop schedule, click “Specify Dates and Locations” on the Year Plan tab. Calendar: It will request your meeting start date (must be in the future), start time for meetings, and how often you meet. It will also provide checkboxes to avoid scheduling the week of major holidays. Click “Update Calendar” to match the year plan to your meeting schedule. Location: You can add, delete, or edit location names and addresses to assign to your meetings. Helpful Hint: You are able to change date, change time, or cancel a specific meeting by clicking the Calendar symbol next to the corresponding meeting. NEW! Combine Meetings option is now also available by clicking the Calendar symbol! “Combine Meetings” offers you the opportunity to merge two or more meetings of content into one meeting date. If you add meetings of different program levels, you can merge those meetings, too! If the regular schedule changes, find the Gear (settings) symbol to the right in order to update your calendar from that date forward. Add Meeting: If you wish to add additional meetings during the year, visit your Year Plan tab, and click “Add Meeting” to view the filterable Meeting Library. Click “Select Meeting” once you find the desired badge or award. “Add to Year Plan” will save it & add it at the end of your year plan for you to drag and drop into your preferred order. Add Activity: If you wish to add a troop day trip, Service Unit event, or council program, visit your Year Plan tab, and click “Add Activity” to build a custom activity or register for a council event. For council activities, it will search like our Events Calendar, and clicking “Register Now” will add the event to your year plan & send you to Doubleknot for completing registration. Replace Meeting: If you decide later that you would like to replace a meeting for something else in the Meeting Library, select the intended meeting from within the Year Plan tab. Once the meeting plan opens, click “Replace This Meeting” as seen to the right in order to view other options, click “Select Meeting” to make the change, and click “Add to Year Plan” to save it. Meeting Overview is the summarization of your meeting as a whole, including: notes for volunteers, idea to prepare ahead, how to help from friends & family network, any award connection, and meeting length. Activity Plan is the guide for all meeting activities. It will provide the following information for each activity: how much time it will take, recommended materials, steps, tips or notes for volunteers, and even occasional scripting suggestions. For some activities, it will also give variation ideas to better fit your troop. Materials List tells you everything needed for the meeting by activity, such as craft supplies & printed meeting aids. Edit/Sent Reminder E-mail will open a pop-up box with a scripted e-mail template relaying information from the meeting’s overview or the event’s details. You can choose who the recipients are, customize the e-mail to match their troop’s needs (such as adding reminders or information to parents), attach council forms or meeting aids, and send the e-mail directly from the pop-up. There is also an option to e-mail contacts as a group or individually for additional communications. You can go to the “My Troop” tab to see each girl’s family contact information. The e-mail address is a hyperlink which automatically links directly with many e-mail services. Record Attendance & Achievements will open a pop-up box with the girls’ names. In the pop-up, you are able to check off that a girl was present and/or earned the badge or award from that meeting. You can go into the “My Troop” tab to view each girl’s individual attendance and achievements record, as shown earlier. Parents can only view their daughter’s tracking. Meeting Aids include worksheets, songs, and other types of PDF reference materials you will need to print for the meeting activities. Meeting Agenda lists all of the activities for the meeting with the planned times for each activity. You can add your own pieces to the agenda, such as snack time or troop government time, by clicking “Add Agenda Item” below the agenda. You can change the order of activities by dragging and dropping or delete activities by clicking on the activity title & selecting “Delete This Agenda Item.” You can also edit the times allowed for each planned activity if more or less time is desired in 5 minute increments up to 30 min.